With the official arrival of fall this week, the days are getting shorter, the nights are getting longer, and the "winter blues" may start creeping up on people who suffer from seasonal depression. The condition known as Seasonal Affective Disorder (SAD) is a form of depression that sets in during the fall and winter, and typically lifts by spring. It affects about half a million people in the U.S., according to the Cleveland Clinic, while 10 percent or more of the population may experience a milder form of seasonal blues. The incidence of SAD is higher in northern states and in areas where the weather is often cloudy. SAD is far more common in women than in men, with women making up about three-quarters of the cases, although the Mayo Clinic notes that men may suffer more severe symptoms. It often seems to run in families. In addition to depressive feelings, people with the condition may experience carbohydrate cravings that lead to weight gain; one study found a high rate of binge-eating in women suffering from SAD. It may be related to disrupted levels of melatonin, the hormone that makes you sleepy. Melatonin is normally released by the brain in a roughly daily cycle to maximize levels around bedtime, and minimize them when you wake up. Dawn should signal your biological clock every morning and reset your daily hormone cycles, including melatonin levels. Then sunlight should keep melatonin levels low through the day until they rise closer to bedtime. But some people start their day with high levels of melatonin that never quite go down as low as they should go, or the melatonin cycle completely breaks down. The result? Sleepiness and mood disorders. The current standard treatment for SAD is to replace missing light signals through light therapy -- soaking up artificial sunlight for anywhere from 15 minutes to an hour or more each day. 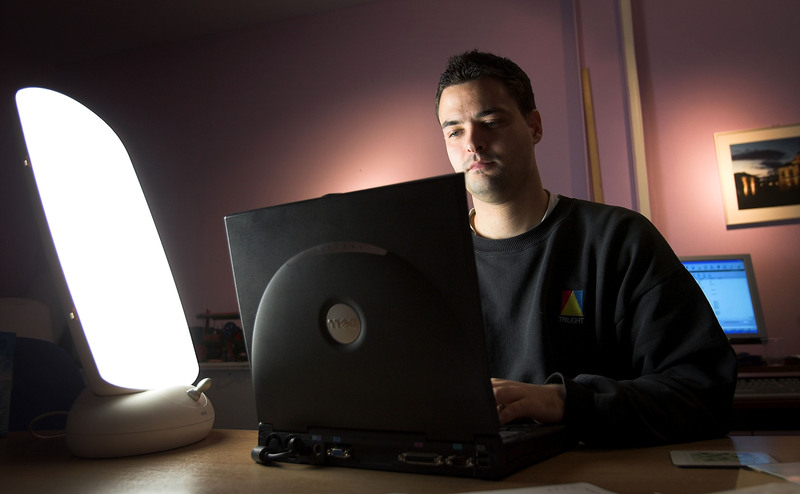 Many patients do therapy at home with fluorescent light boxes that can be purchased online. But doctors warn that before you go out and buy a light therapy unit, if you think you are suffering from depression, you should be under a physician's care. According to Columbia's Center for Light Treatment and Biological Rhythms website, a light box should generate very bright light, about 10,000 lux (a measure of illumination). They should filter out harmful UV rays; these light boxes are not the same as tanning lamps. Even so, people with light-sensitive skin conditions, retina problems, or who are taking light-sensitizing medication may not be able to do light therapy. The FDA has not approved or regulated light boxes as medical devices, so there is no government standard for what a unit must do. Insurance may not pay for them, and not all light boxes on the market are necessarily safe or effective. Three-quarters of the patients studied by the Columbia research center saw improvement after 30 minutes of sitting near the lamp, but not looking directly at it. Most people found that early morning treatments worked best. Patients often show improvement within a week, but most need to keep it up until April when the days are long enough that light supplements are no longer needed. One new variation on this treatment involves light units that can slowly tune their colors to mimic a natural dawn. The National Alliance on Mental Illness notes that in addition to light therapy, some patients with SAD also benefit from cognitive behavior therapy, which has proven effective for other types of depression.